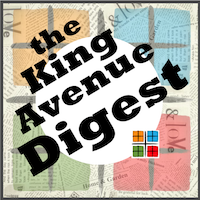 The King Avenue Digest highlights the biggest "good of the order" events, and those that are most close at hand. Look through the articles on our Home Page (kingave.org) or within ministry and mission pages for more comprehensive happenings that pertain to you. Click HERE to download the February 2019 Carillon Newsletter. Kurt Reichert is beginning a series of bi-monthly art classes geared for the person who is intimidated by art. DON'T BE! These classes are designed for anyone. With each class you will learn a basic technique and create a project. The goal is to depart and put your own spin on it. The first session is Put some Art in your HeART at 7:00pm Monday, February 4 in the Art Gallery at King Avenue UMC. Students will create tissue paper collages using heart shapes. The cost is $5.00 and can be paid the night of the class. You do need to reserve a spot. Please RSVP via email to kurtfreichert@yahoo.com by Sunday, February 3. The sermons in February and March will be based on the ideas in Jonathan Merritt's Learning to Speak God from Scratch. We struggle to talk about faith and faith related issues. Many sacred words have become so loaded with negative connotations that we avoid them. As a consequence we avoid conversations which could deepen our faith and the faith of others. We miss the reality behind the word. Each week the sermon will attempt to look a word in a fresh way. Words such as God, pain, disappointment, prayer, confession, fall, creed, lost, and perfection. Special Offering for NNEMAP, Sunday, February 10. This is to meet the increased need NNEMAP has encountered this winter. The city's new parking regulations for the area have gone into operation. They will have some effect on parking for King Avenue Church. Learn more about Grief Recovery Method and the Support workshop by attending an informational meeting, Monday, February 18 at 7:00 pm. “Assemblage” is the name of the annual group show in the King Avenue UMC Gallery for January and February. Assemblage means a group of people or things. This is a fitting title because this show is a group of artists and their art. The variety is amazing and it’s wonderful to see the talents of so many artists in one exhibit. This year we are pleased to show the work of Robert Bazzle, Felicia DeRosa, James Edinger, Angela Finney, Nancy Heber, Evy Hummon, Martin Kehlmeier, Sheryl Lazenby, Andrew Mitchell, Eric Mize, Janet Reichert and Kurt Reichert. Please stop in the gallery and reflect on the displayed art. Mark your calendars for the upcoming February and March events for King Avenue Children, Youth, and Family Ministries. Click here to download the FEB/MARCH Flyer. "We invite, welcome and honor all people and nurture them to grow in service with Christ." King Avenue has two different worship services each Sunday. Worship each Sunday is at 9:00am, and 11:00am. 9:00 Morning Blend: This is a smaller, more informal service is in Fellowship Hall. Coffee and donuts are available before and throughout the service. The music is eclectic and the atmosphere is friendly and relaxed. 11:00 am Traditional Worship: This traditional service in the sanctuary featuring the music of our wonderful Chancel Choir and our very talented organist. Sign Language Interpretation is available the 2nd and 3rd Sundays of each month. Dress is casual. Faith Dive Sunday School class meets at 10:00 am in the Logos Lounge (L1). Visit our Adult Faith Formation Page for more information about additional faith formation opportunities. Additional Children, Youth, and Family Ministry Happenings. Visit our KACYFM Page for more information about upcoming events. Coming Out with God is an adult, faith-based discussion group offering support and encouragement for anyone in the “coming out” process. We use various resources that emphasize God’s grace and unconditional love. The group focuses on and strives to deepen our identity in Christ as we come out to family, friends, coworkers, etc. We welcome all, whether you are in need of support or you wish to encourage others by sharing your own “coming out” experiences. We meet in six-week sessions Wednesdays, 7pm at King Ave United Methodist Church. Acknowledging that "coming out" is more a process than an event, you are welcome to attend the group in the way that fits your needs: attending a six-week session, dropping in as desired, or becoming an ongoing member. For questions and meeting schedule, contact Mary Bostian, kingcowg@gmail.com. Visit our SPECTRUM Page for more information about upcoming events. K Cups - Single Serve Cups 12 cups/box are environmentally-friendly single serve cups are made from recyclable plastic and aluminum. Enjoy all the convenience with less waste! Tea - We are proud to partner with small scale growers in India and South Africa and Sri Lanka to build the alternative supply chain of small farmer grown tea. 4-5 volunteers serve food and wash dishes on the 4th and 5th Saturdays of every month from 8:30-10:00 at Gates Fourth UMC. Gates Fourth is located at 119 E Gates St, Columbus OH, 43206. King Ave ClothesShare - Infant and Toddle Sizes passed down to other King Avenue families. Visit our Community Service Page for more information about upcoming opportunities to help. Click on links below for other fellowship opportunities.